In the run up to most major games, you can expect rumours, leaks and fakes. Pokémon is certainly no exception, and probably exceeds most in the sheer hype that surrounds new Pokémon games. For those of you who don't know about the new Pokémon games thus far (or possibly even that Pokémon was still a big thing), then here is a brief catch up. 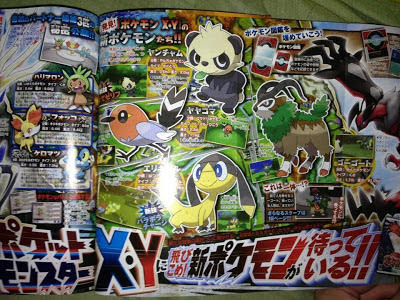 So far we know 6 new Pokémon, the three new starters, Froakie, Fennekin and Chespin. As well as the two title legendaries called Xerneas and Yveltal, one of which looks like a bad Studio Ghibli knock-off, and finally a controversial Eeveelution whose type can be charitably described as unknown. Anyway, now you are up to speed, to the leaks! 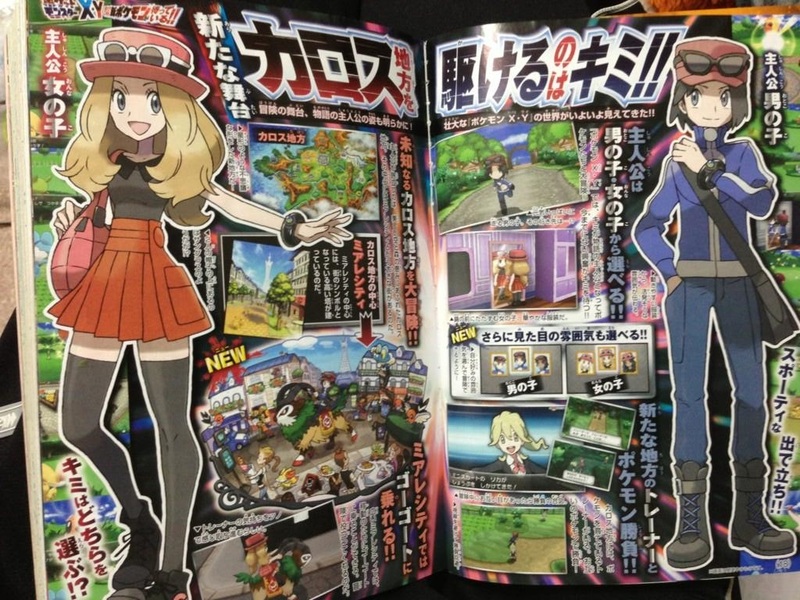 We now have confirmed concept arts of the Male and Female protagonist, though they are still nameless. They both have strange devices on their wrists which look like they are Pokégears of sort. Also, the guy looks pretty lame. The map is clearly France, in combination with the tower, palace and arc, then hopefully this will put an end to the debate as to where this is set. Also, on the PokeFrance map, you can see a city where PokéParis should be. I believe PokéParis to be called Miare City. It is also interesting to note that PokéFrance looks much more mountaenous than regular France. We can stop calling it PokéFrance, it has a name, it is the Karos Region. (Looks like some of PokéGermany might become a thing. We also have a picture of the female protagonist riding a goat in game, I believe this Pokémon is called Gogoat. However, it doesn't seem like you will be able to ride your GoGoat wherever you please, and it is unknown whether you can only ride Gogoat, or whether you can ride other Pokémon. This also opens up the floodgates for finally having Surf animation be more than just a Blue blob. 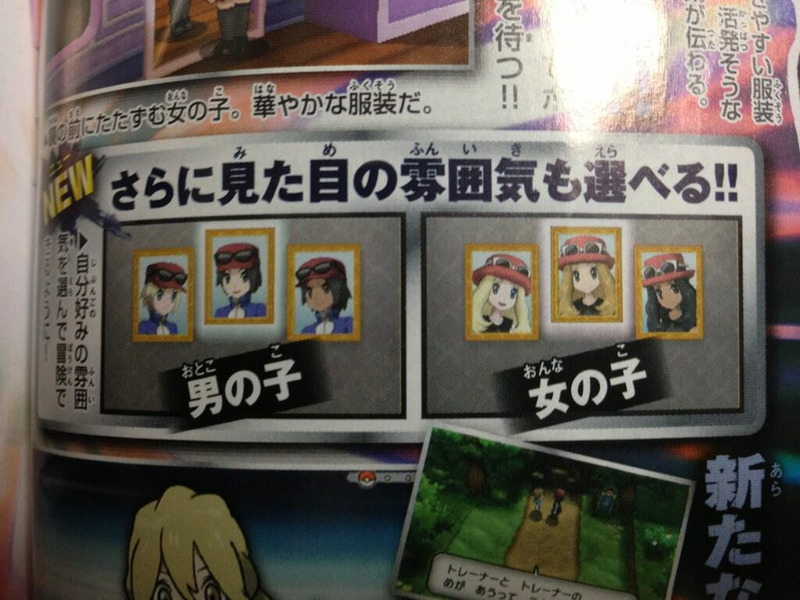 We also have a picture of a wo/man in the bottom left who has been speculated to be a rival. Looks slightly N like, some have argued it also looks like Bianca, though at this point when we don't even know the gender, it is hard to say. Upon further zoom we can see the rumours of character customization are true, though to what extent you will be able to customize is as of yet, unknown. Nor is it known if hairstyle and skin colour is interchangeable. This also seems to be shaping up for some sort of return of Contests. A scary prospect, or a welcome return, I'm not sure. 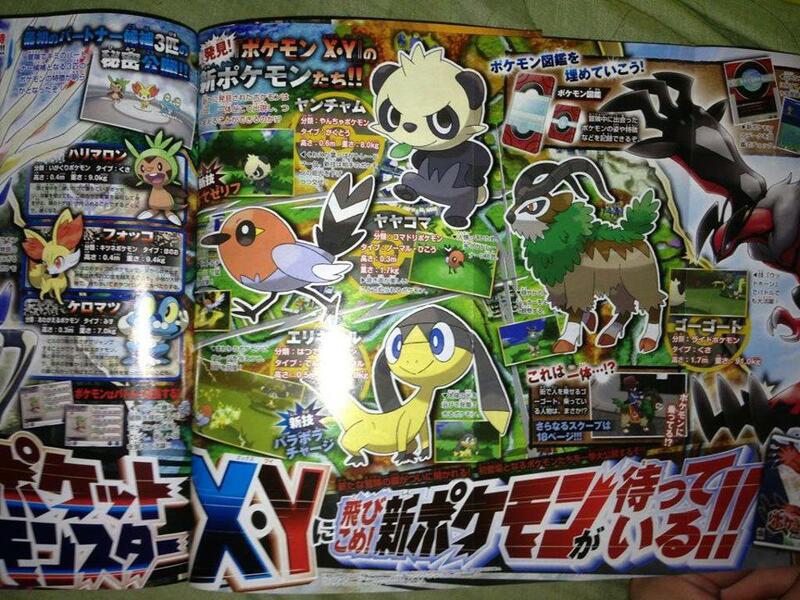 Now we have these four handsome chaps as the four new confirmed pokémon of X and Y. The Goat is obviously called Gogoat (ゴーゴート literally Gohgohto) It's a Grass-type. You can ride it, though seemingly only in Miare city. I think it looks alright, has like, handles for you to hold onto and stuff. 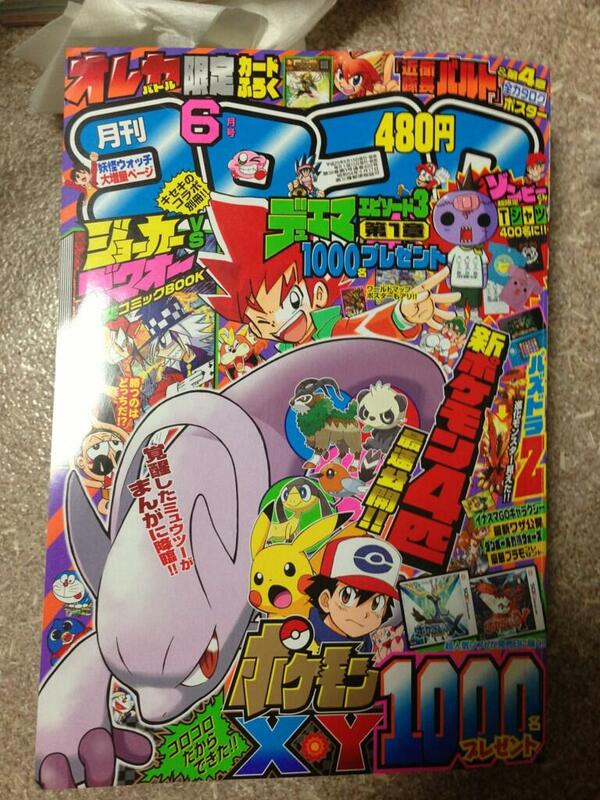 The weird Lizard/Dog thing is Elikiteru (エリキテル) and is a Electric/Normal-type. This thing looks so spazzy it hurts. 2/10, would not train. The Bird is called Yayakoma (ヤヤコマ) . It is Normal/Flying type. Can learn fire moves, possible fire evolution, if so, count me in, if not, give me Staraptor. The Panda is called Yancham ( ヤンチャム). It is Fighting-type. Everyone seems to be loving this guy but I think unless he has two good evos like the Slaking line does, then count me out. Each is confirmed to learn a unique move. Gogoat learns Horn Leach. Elikiteru learns Parabola Charge (giga drain for electric types). Yayakoma learns Flame Charge and Yancham learns Parting Remark. 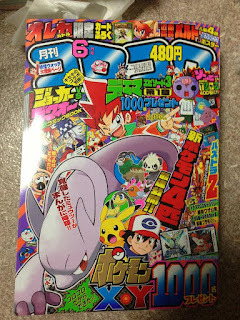 And then this is just the cover, all that is really interesting about this is the Box Cover Artwork is in the bottom corner, confirming that the Y Pokemon goes with Y and the X Pokemon goes with X. Good work Game Freak. Also that Ash seems to have been rebooted once more for the next Gen. 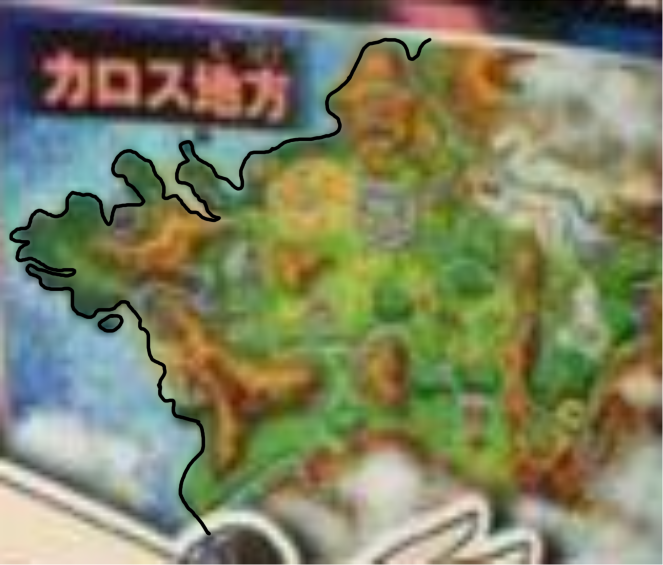 Bonus PokéFrance/Karos Region Map Zoom in. Just incase you were in any doubt that this is France. As I said, seems less bio-diverse, but that isn't a bad thing, lots of Mountains, couple of large cities, some itneresting clouds around the Pyrenees and Germany/Low Countries. I really like Pokéurope as an idea, so keep on trucking Game Freak. Parting remark? Seriously? What, like he shouts 'you're a loser, and you smell!' and his opponent collapses in a melee of humiliation. The male and female protagonists..my money's on Cheryl and Justin. Yeah Parting Remark sounds like it is going to be a pathetic version of U-Turn. Losing to that Panda would be pretty humiliating. I actually really like Cheryl, clever, in my head however the guy is already called Xavier. I don't think our good friends Cheryl and Xavier will have much trouble with Parting Remark...they look fairly thick skinned. True, and they can even change their skin colour now...Though I can't wait to see how that is justified in-game (Very good if Thick Skin was an ability reference btw). They can invent all the new pokemon they like but my heart will always belong to Ash and Pikkachu. While I agree with you in theory, I have been playing an awful lot of Pokémon White recently. The original Nintendo version involves the battle between the different Pokemon characters. Players act as trainers that lead their pets into the battle. The better trainer wins the game.